The Good: Fine single player action. Solid pacing. The Bad: Enemy AI isn’t the sharpest knife in the drawer. Elizabeth is a very odd creature. The Ugly: Story lacks cohesiveness. Ten minute ending movie is nearly incomprehensible. 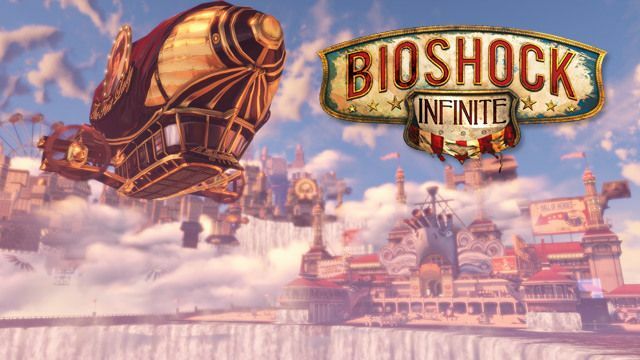 I’m going to go against the grain here and say that, while I really liked BioShock Infinite, I don’t think it is as good as the previous BioShock titles. Rapture was a beautiful, self-consistent world full of wonder and intrigue. 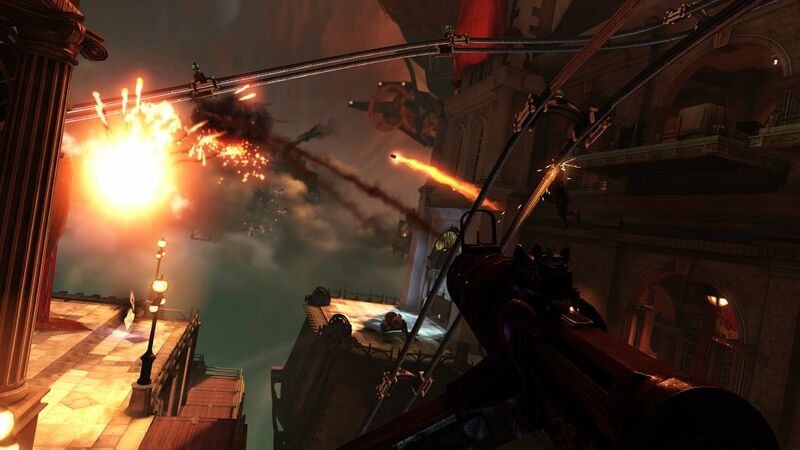 Columbia, the floating city of BioShock Infinite, is a rat’s nest of space/time folding and parallel universes, religious claptrap, and metaphysical mumbo jumbo concerning destiny and free will, and is often so large that it doesn’t feel like a magical floating city at all so much as just a big open-world shooting gallery. 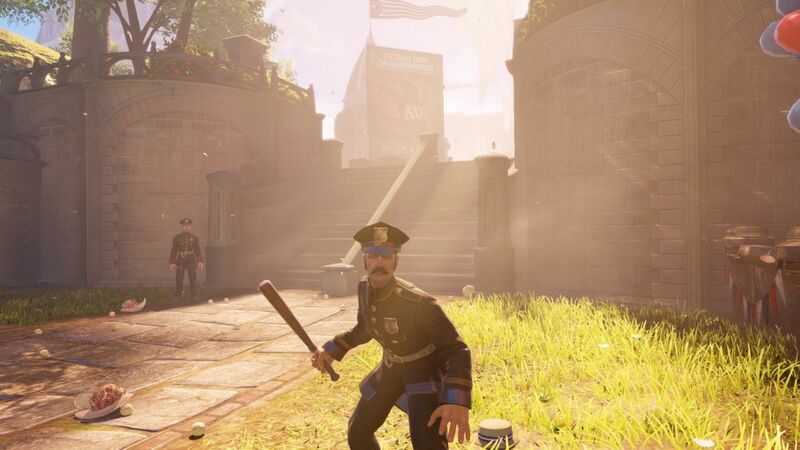 There are some mighty peculiar things going on in Columbia, the grand floating city of BioShock Infinite, almost the least of which is that the whole meshuggana city is floating. 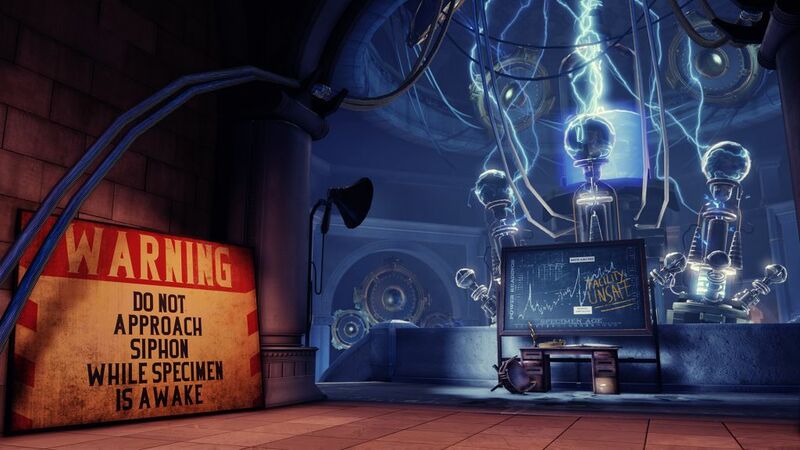 This being a BioShock title, it is not unexpected to find that Columbia, shining beacon of vast potential and higher thought, has become a corrupt and crumbling dystopia. Nor is it surprising to find psychic powers (here they are called Vigors) run amok. I’ll even go so far as to say that a giant mechanical caretaker hybrid of a gargoyle and a pigeon called the Songbird doesn’t even strike me as all that odd. No, the weirdness is in the magical clothing that is scattered about, and the freight shipment system that is part railroad and part rollercoaster, and the prevalent, oh, I’ll call it a religion, a bizarre combination of Christianity and something best described as Found Fatherism. Should we stick in a tip of the hat to the whole Occupy Wall Street/47% thing. Sure! How about rips in the space/time continuum? Why not? Though obviously recognizable as being in the BioShock mold, BioShock Infinite throws a lot of new gameplay elements against the wall, and to its credit some of them stick, but it does get a little overly zany, and the enemy AI seems at times unable to cope, making me almost yearn for the greater normalcy of Rapture. You play as Booker DeWitt, an alcoholic, down-on-his-luck private eye fleeing the ghosts of his past. You’re also an awful gambler, so when parties unknown offer you the chance to erase your debt in exchange for rescuing a girl, Elizabeth, held hostage on Columbia, you realize you have little choice in the matter. Upon arriving at Columbia, you find rescuing Elizabeth to be more complicated than you had expected, naturally. There is a revolution simmering between the city founders – the rulers, highly religious, puritanical, racist white guys – and the Vox Populi (Latin: The voice of the people – I knew my 7 years of Latin classes would come in handy someday, and now it has) – it’s easiest to think of them as the Occupy Wall Street crowd. You learn about all of this, as in the previous BioShock titles, via film strips and Voxaphones (a kind of portable record player) lying about. There are small (really small) occasions where you choose to side with one group or another (early on you are given the opportunity to throw baseballs at an interracial couple), but the impacts of these choices are much less significant than the save the girl/kill the girl decisions of BioShocks 1 and 2. In your roamings you pick up the usual variety of weapons: handgun, machinegun, carbine, shotgun, sniper rifle, mortal launcher, RPG, etc. These come oddly in two flavors: those of the rulers, and those of the Vox Populi. So upgrades to the machinegun do not improve the Vox Populi burstgun, despite the fact that it is more or less the same weapon. You can carry only two at any given time, but incongruously can haul around ammunition for all of them at the same time. Go figure. You also gain the opportunity to pick up Vigors. 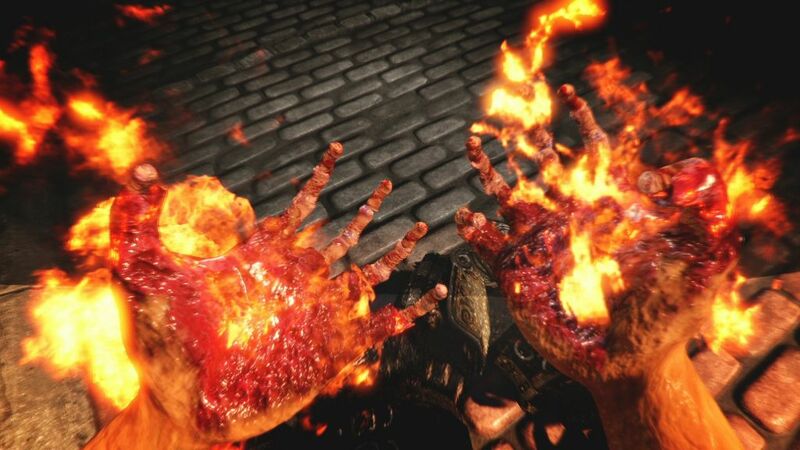 Fireballs, electrical shock, possession – these are instantly familiar to anyone who has played the previous titles. I don’t recall ‘Murder of Crows’ in which you release a slew of bloodthirsty crows from your fingertips, nor do I recall one they call ‘Bucking Bronco’ which suspends opponents in the air (makes them mighty easy to shoot that way). Nor Return to Sender a power that reflects damage back at your enemy. There are eight vigors in all. Vigors can be “fired” as a melee weapon, or laid down as a trap. In the previous BioShocks these powers were fueled by EVE (a serum more or less like mana) while in this go round they are powered by… salt. I don’t think they mean Sodium Chloride, NaCl, table salt, though you can get salt from many types of food you can eat (coffee, for example, apparently in this world contains salt, as do cigarettes). There are also salt vending machines, and people leave vials of it around as well. 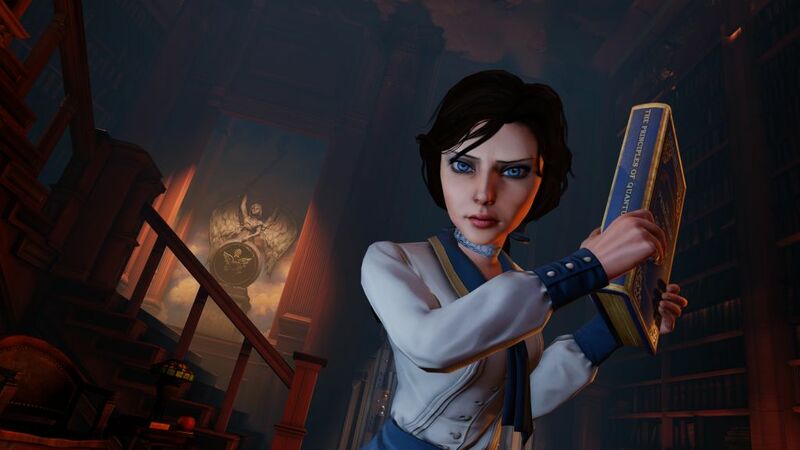 Because it is available from so many sources, many of them free, there is rarely a salt shortage, which seems to make BioShock Infinite a more power-intensive game than the previous titles. Of the new additions to the BioShock gameplay, I have to say the most fun is the rail system. Using a sort of hook (which incidentally makes for a pretty gory melee weapon), you can clamp onto the rail system that ordinarily moves cargo around and go for a ride, and what a wild ride it often turns out to be. You can speed up or slow down, or jump from one rail to another and change direction. The closest analog would be sort of cinematic driving portions from other FPS games where the vehicle drives itself, and you ride along and swivel around and shoot things. The AI doesn’t deal with the rail system well – they are almost completely vulnerable to diving attacks off of the rails to the point at which you can bring down even heavies with laughable ease just by jumping on and off the rails. Somewhat less interesting is the addition of various gear – clothing actually – that you wear to give you additional powers that sometimes augment various vigors and sometimes just give you an additional power. The first one I think is a set of pants, and when you wear them, jumping off the rail system, you give off a blast of fire when you land. I know, seems kind of random, right? Others give you extra toughness, or improved attack effectiveness, extra loot dropped by dead enemies, period of invulnerability, all sorts of things. These hats and jackets and whatnot feel like nothing more than a catch all for powers they wanted to include but couldn’t think of a good way to implement them. The most peculiar addition to the gameplay has to be Elizabeth herself. When you pick her up she acts as an NPC. She follows you along and has some stories to tell you about herself, and reacts to posters and signs that you come across. She’ll pick locks for you on request (provided you have a lock pick to give her to do so). 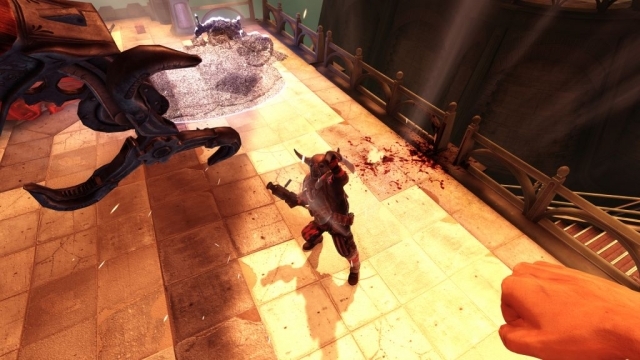 In fact – and here’s an interesting bit – BioShock Infinite lacks any minigames of any kind. You no longer have to play Pipes to bypass vending machines. All that stuff is gone. And while I applaud their desire to remove repetitive minigames and get rid of some of the drudgery, this approach doesn’t work well from a narrative perspective. Why does Elizabeth pick the locks? Why not just let me shoot locks and be done with? You don’t need to protect Elizabeth in combat (the game tells you quite bluntly via a popup – “you don’t need to protect Elizabeth in combat”). It’s not that she protects herself, but she just seems to be invulnerable. Whatever. She occasionally (kind of often actually) “finds” money and ammunition (coincidently for the weapon you’re firing at that moment) and med packs and gives it to you. Oh, and SHE CAN RIP HOLES IN SPACE AND TIME! How’s that for a power? Then she brings things through the rip to help you out – weapons, health packs, turrets. So she is not only a very peculiar woman, but she’s a very peculiar game mechanic as well. And I’ve got to say that what starts as a pretty cute gimmick rapidly becomes so common in the game that it is ludicrous. 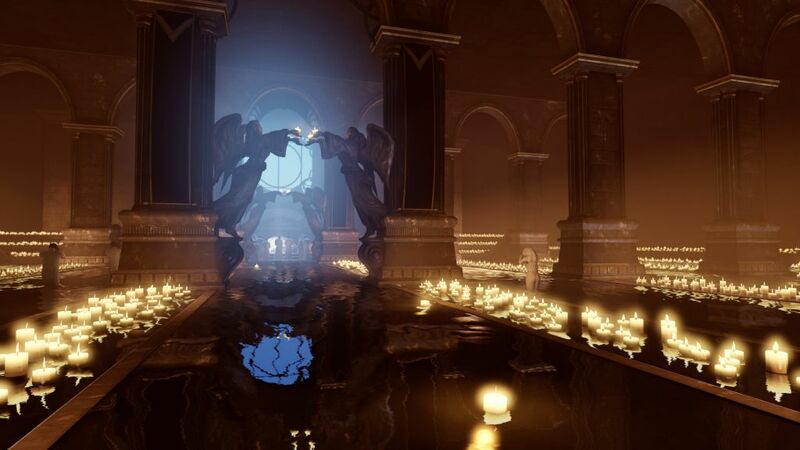 Columbia is no less beautiful than Rapture in concept. The city floats, majestically, mysteriously (they cite quantum mechanics and some nonsense about suspended particles), above the clouds. Large public spaces are monolithic islands – that is to say one big piece. Some sections are so large that it doesn’t feel as if you are afloat, unless you make an effort to travel to the edge and look down. Jumping off just makes you reappear on solid ground again. Smaller buildings, stores, and apartment houses, move about, docking and undocking here and there on a schedule. 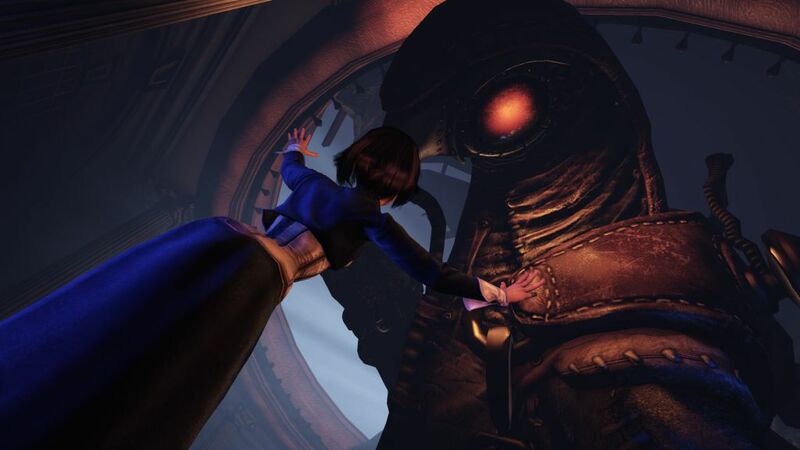 The greatest difference between Rapture and Columbia however is not the architecture, but that the society of Rapture was well past its peak during the events of BioShock 1 & 2. 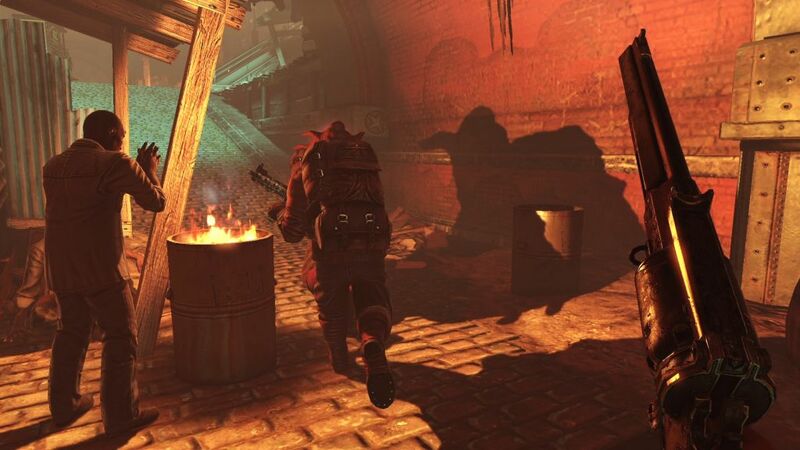 It was not unnatural therefore in Rapture to find vast deserted areas, closed shops, and regions inhabited by only raving madmen and splicers. 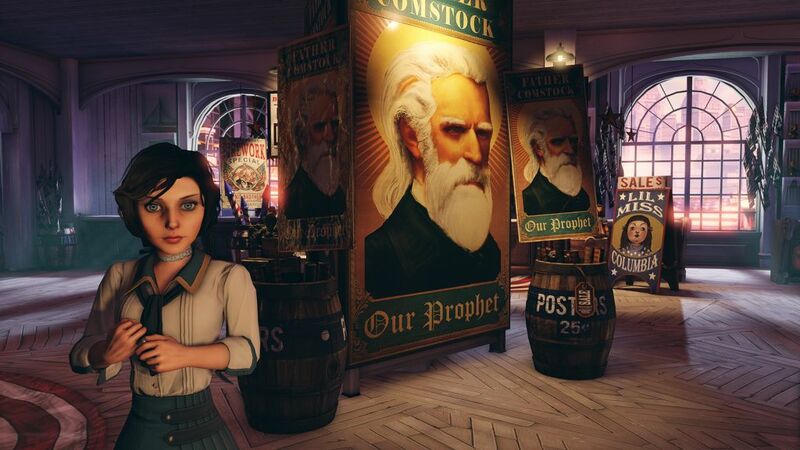 Columbia is supposed to be a living city in BioShock Infinite, so the vast empty areas feel plastic, the rows of stores all “Closed” or “Back in five minutes” are artificial. Even the people of Columbia don’t seem to do anything other than stand around talking about the rebels and the prophet, and staring at you when you come too close. Subsequently while the world of Rapture felt real, Columbia always seems fake. 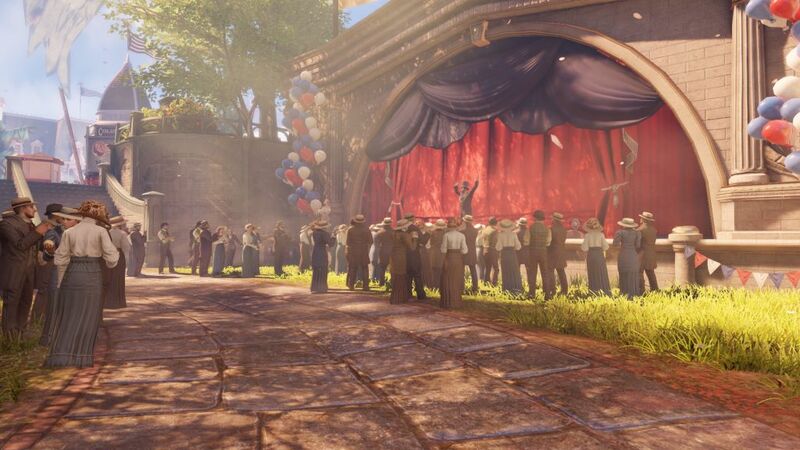 My first impression of the game, the first six hours or so of play, was that BioShock Infinite is a lot of fun and wonderfully architected, but lacks the narrative spark of the previous BioShocks. All the posters and Voxaphones and people spout religious pseudo-nonsense and the same Occupy Wall Street claptrap that IMHO bogged down the last Dark Knight movie. Beyond six hours the difficulty curve really fell off (not that it was terrifically high to begin with except for a few small spots, at least on normal). With the exception of some heavies and a few boss battles, you kill a lot of cops and rebels who are so delicate that it’s almost funny. 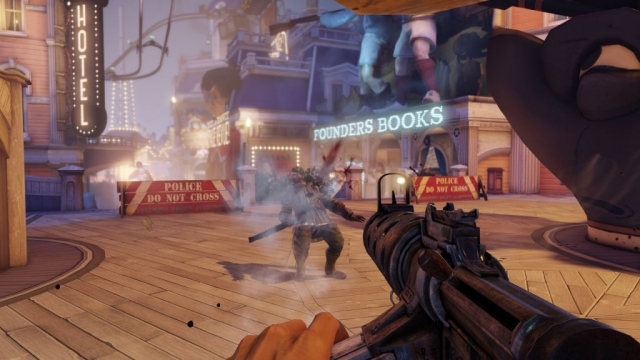 You have a rechargeable shield in BioShock Infinite that you can buff up as the game goes along, until you reach a point where you can fire an RPG at your own feet and not even bring it down. Towards the end, the 15 hour mark, I had 6000 silver eagles with nothing I’m interested in buying, my salt and shield are maxed out, there are 17 lockpicks in my pocket, I’ve got 14 pairs of clothing I never wear, and the space/time continuum, along with any narrative sense to the story, is completely shattered. 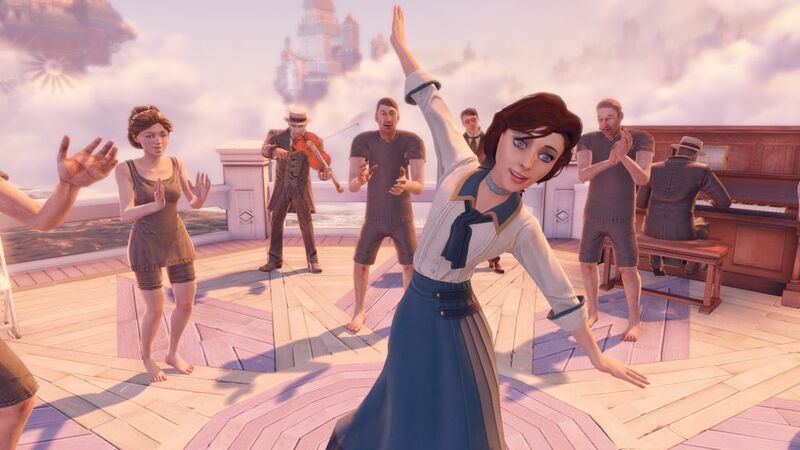 I don’t dislike BioShock Infinite (as my score attests) but Rapture was a more thoughtful, engrossing, and better assembled experience. 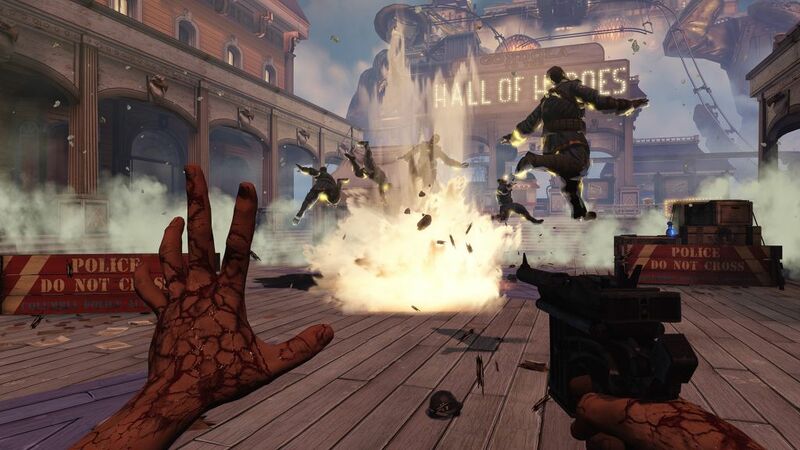 This review is based on a digital copy of BioShock Infinite for the PC provided by 2K Games. I like your reference to the Dark Knight movie as I was thinking that if this would have been a movie, Christopher Nolan should direct it. 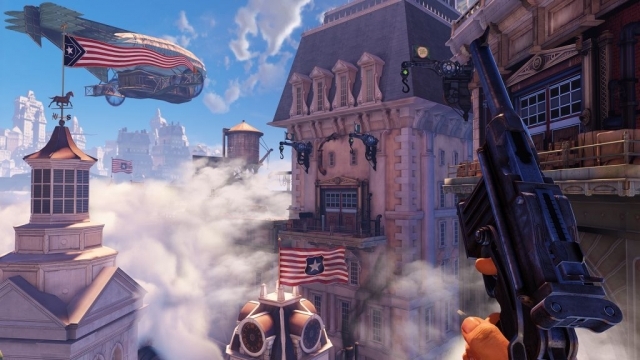 BioShock Infinite embraces the idea of American Exceptionalism, although this is not the first game (I think) to cover such idea – the game is unique in so many ways.